We all know that I'm a fan of Clarins skincare (post here) but I hadn't tried very much of their makeup until recently but I am now fangirling over their Summer Makeup Collection. Every year, they release a range of products that will give sunkissed skin and bring some colour into our lives and this year, they've gone one step further by adding a new primer to their range and it's a goodie! Earlier this year, Clarins released a range of SOS Primers to address all skincare concerns - dullness, redness, fatigue, pores etc but they have now added a Bronze version to the range. This primer has all of the benefits of the original SOS - it blurs pores, adds some hydration and luminosity, but the bronze version is tinted so it adds some colour to the skin too. I personally have been loving wearing this on no-makeup days because it evens my skin out, adds a hint of colour, blurs my pores and generally looks like my summer skin, but better! I don't like to use fake tan on my face as I find it clogs my pores and doesn't suit my dry skin so this is the perfect solution for me - it adds a hint of colour (don't let the word bronze scare you - it's actually quite natural!) and blurs my pores, rather than clogging them! I have also mixed it with foundation to deepen the shade and it has worked a treat! I will be buying a back up of this before it sells out because I'm wearing it on a daily basis at the moment! £26.50 from Clarins, John Lewis, Debenhams UK/Ireland and House of Fraser. The packaging alone of the Limited Edition Summer Bronzing & Blush Compact made me want it! Unicorns and mermaids are not my thing, but flamingos? Yes, I can get on board with that! This compact contains a whopping 20g of product and the sturdy case and large mirror means that it's ideal for travelling or in your handbag. Inside are three shades of bronze/blush (how you use it will depend on your skin tone), with the Clarins logo and flamingos embossing. The three shades mean that it can be used in a number of ways - the lightest for blush, the middle shade to contour and the bottom shade for general bronzing. My preferred method is to swirl my brush around all three as this gives a natural, sunkissed look to my skin. The finely milled texture of the powder makes it easy to apply and blend and there is no fear of that muddy look on the cheeks. This is limited edition so if you want it, don't delay in ordering! £32 from Clarins, John Lewis, Escentual, Debenhams UK/Ireland and House of Fraser. 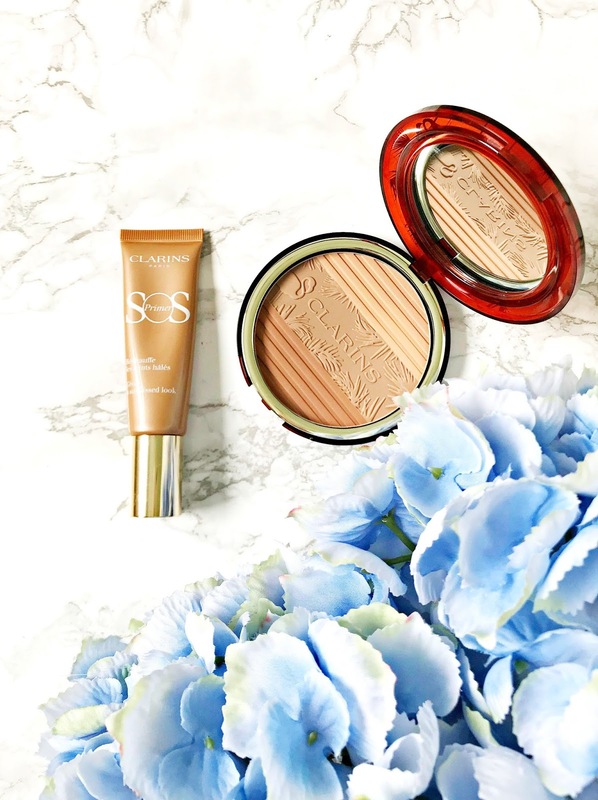 Both of these products have me set for summer and will be definitely in my holiday makeup bag next week! Are you tempted by either of them? I'd love to hear!